Last week was one of reflection and remembrance of that horrible day, September 11, 2001 – so many memories. This past Thanksgiving Day our family, along with friends, took the train to NYC for the Macy’s Parade, and part of our day involved going to the 9/11 Memorial. It would be impossible to put into words what I felt because the memory of that visit just after the attacks remains so fresh and real. The picture in this post is from the yet-to-be-completed museum that is situated on a corner of the Memorial property. If you could actually stand in that spot you would see twisted metal from the original structure on the other side of the glass. It remains as it was from the moment of the collapse on that horrific day. Because we are unfinished, in some way, each of us is like a monument of twisted steel. We bear the reminders of our painful experiences. Some of that pain is self-inflicted, but some, the result of what has been inflicted upon us. 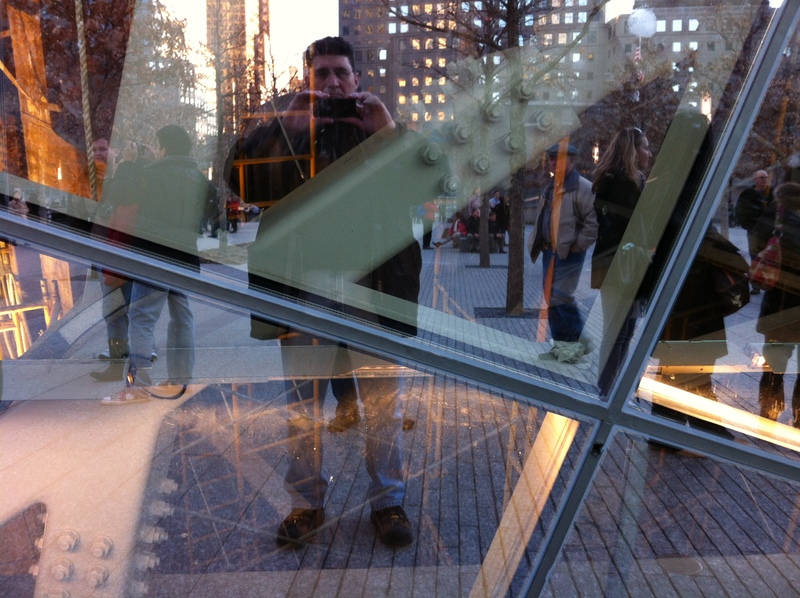 While going through pictures from the Monument, I realized that this picture was not only of the twisted steel from the attack it memorializes, but also my own reflection as well. Yes, that’s me in the picture. I’ll get back to the picture in a moment. At the end of the day, when it comes to being free from the chains of the memories of past hurts, the gospel clearly teaches that the only path to such freedom is that we forgive. I know that sounds crazy, but it’s true. The best way to understand this is to consider when you have ever been hurt. I mean really hurt. Damaged. Wounded. Stolen from. Humiliated. Disgraced. Devastated. Crushed. Cheated. You know what I mean when I say that such things bring unspeakable pain. What did you want when this happened? Revenge? Probably. If you’re human. I get that. We want someone to suffer as we did. But in his profound book, Free of Charge, Miroslav Volf says that when we say we want justice, we really want revenge, and we always want to cause more pain than we experienced. That is our nature. We say we want justice, but we would never settle for that. No, the answer is to forgive, and the way to forgive is to do more than make a pronouncement – such pronouncements usually come from a misguided sense of Christian duty, but lead to even more bitterness and mounting resentment. No, Volf says that to forgive is actually to condemn, and then to leave it to God for vindication. But this is no cakewalk, and in fact it is impossible to forgive, unless, as in that picture, we see ourselves in the wreckage caused by others. Because the truth is that behind every evil act is an evil intention, and I am full of evil intentions, even if I don’t commit those particular acts. Only God’s grace restrains my wicked imagination. And my only hope for more than surviving, but also for being truly free, from the evil that has been committed against me, and from the tyrannical prison of daily bitterness, is to see myself in it, and to believe that while I never have to excuse sin or bear the blame for someone else’s sins against me, I also don’t have to live in the daily misery of reliving what may never be reconciled on this side of heaven. Frankly, that’s their problem! Essentially this is Jesus’ point in His story of the Unforgiving Servant: Forgiveness always begins by seeing that we too have been forgiven much (Matthew 18). Craig Krueger here. Thanks so much for the blog. Definite words of wisdom there. You are currently reading the Man in the Glass Window… at unfinished1.